Too late. It is a common refrain in the recounting of why so many people in Africa are dying from cancer. Idah Kayombo in Lusaka, Zambia knows too well the meaning of too late. “My cousin died because she was not aware she had cervical cancer. By the time she was diagnosed, it was too late to do anything about it,” she stresses. She believes access to information might have made a difference for her cousin and many other women who have died from cervical cancer – a preventable disease in most cases. The Ministry of Health in Zambia agrees and has been doubling up its efforts to provide Zambians with improved cancer-screening facilities and now lifesaving health information. The latest development in access relies on digital technology to ultimately reach into the country’s remote corners. In 2016, the Ministry of Health introduced the mHealth, a channel for sending clear and brief mobile telephone text messages on cervical cancer, its risk factors and what communities and individuals can do to protect against the disease. The initiative, which is only operating in Lusaka for now, is also known as Be He@lthy, Be Mobile. It is a joint programme of the World Health Organization (WHO) and the International Telecommunications Union with the African Development Bank, the Ministry of Transport and Communications and the Zambia Information and Communication Technology Authority to eventually blanket the country with health information on a variety of non-communicable diseases. With almost 74% of mobile phone penetration in the country and 51% of the population considered active mobile telephone users, the mHealth messaging on cervical cancer is showing promising results. Preliminary health facility data indicate a 6% increase in first-time screening for the disease in Lusaka and that the service seekers attributed their visit to the information they received from the mHealth alerts. “Since the introduction of mHealth, we have seen an increase in the number of women who come for screening,” says Ebeth Syapiila Naluama, a nurse at the Chawama First Level Hospital in Lusaka. Ebeth screens most of the women who come to her facility and finds that, on any given day, approximately 30 women of varying backgrounds are now coming for cervical cancer screening and information. “Those who have pre-cancer symptoms that are treatable are treated immediately, while we refer the advanced cases to the Cancer Diseases Hospital,” she says. Cervical cancer is the most common form of cancer in the African region, where it accounts for 22% of all female cancer cases and 12% of all newly diagnosed cancer cases for men and women in general every year. WHO estimates that human papillomavirus (HPV) infections cause approximately 68 000 cases of cervical cancer each year in Africa, despite the availability of cost-effective preventive services, including screening and vaccination. In Zambia, cancer in general represents a major disease burden. Cervical cancer is one of the commonest cancers in the country. Zambia ranks third globally in terms of cervical cancer prevalence. Routine cervical cancer screening and early treatment can prevent up to 80% of cervical cancer cases if abnormalities of the cervix are detected early enough – when they can still be treated. WHO recommends periodic screening for all women aged 30–49 years to detect precancerous signs, which are usually asymptomatic. In Zambia, the screening age group is 25–59 years. The low level of awareness among Zambians before the introduction of mHealth about cervical cancer and the available services, particularly in remote and rural communities located far from a health clinic, had led to delays in people seeking out preventive health care, often not until the disease had progressed too far to turn around. In communities where not everyone receives mobile telephone messages or can read them, the vital health information is passed onwards through the age-old low-tech word-of-mouth channel by persons who do see the messages. 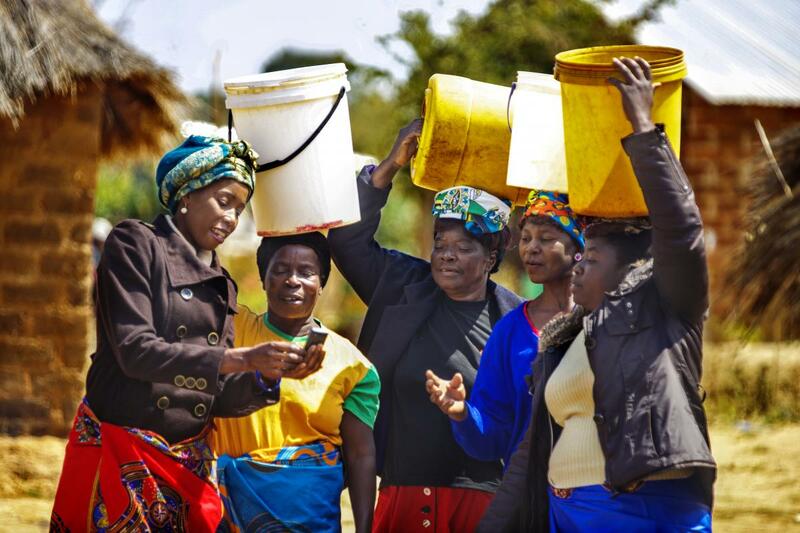 While the mobile telephone message alerts are now drawing more women for early detection, the Ministry of Health has advanced infrastructure in place to meet their needs. The Cancer Diseases Hospital opened in 2007. “We are working with the Ministry of Health to promote vaccination against the human papilloma virus, early screening, treatment, diagnosis and, most importantly, adoption of healthy lifestyles to reduce the risk factors and the country’s high morbidity from cervical cancer,” says Dr Peter Songolo, Disease Prevention and Control expert at WHO Zambia Country Office. Country by country, WHO is working with national health authorities to reduce the overall burden of non-communicable diseases, guided by a global action plan containing nine targets for prevention and control by 2020. The WHO Director-General announced in May 2018 a global call to action towards the elimination of cervical cancer. Eliminating cervical cancer will yield a high return on investment by reducing the cost and health system burden of treating pre- and invasive cervical cancer and preventing the loss of productivity among women at the peak of their working and social lives. In Zambia, there is now increased optimism for bringing down its high cervical cancer morbidity and mortality rates. “Most people now have knowledge on cervical cancer because this mHealth programme has created awareness and a lot of interest,” says a staff member at the George Health Clinic in Lusaka.